It is no wonder that New York City is one of the most exciting places to see in the world! The bright lights, the fascinating skyscrapers, colorful people, not to mention all the books, movies and songs dedicated to it, are among few of the reasons to come here. Even its informal nickname – the city that never sleeps – is enough to get one’s blood flowing. But in such a fast pace, it is easy for visitors as well as locals to forget taking care of one of the most essential needs of our body: to relax. Our Traditional bath submerges you in an ancient Turkish experience unlike anywhere else in New York City! This ritual combines the tradition of the Turkish bath and modern luxury while naturally detoxing and purifying your body and spirit. As toxins are cleared, blood circulation increases and your immune system is stimulated allowing for both physical and mental relax- ation & rejuvenation. The Traditional Turkish Bath Ritual is performed on the “Gobektasi”, a heated marble slab located in the center of the bath. The treatment is a combination of deep exfoliation & a cleansing massage which cleanses your body while easing muscle tension. Upon arrival for your treatment you will be given a traditional “Peshtamel” a Turkish linen that is gently wrapped around your body. The therapist uses original techniques with a “Kese”, a glove mitt to exfoliate and deeply cleanse your body. The treatment leaves you with silky smooth skin and an exhilarating feeling of wellbeing. For optimum results we recom- mend laying on the heated marble slab for 20 minutes prior to your treatment and relaxing next to the “kurna”, a small marble basin, while pouring water on your entire body with the copper bowl. To best prepare for this once in a lifetime experience, we suggest that you do not apply any body lotion, cream, or perfumes prior to your treatment. Our uniquely focused massage relaxes sore muscles and stiff joints with Russian massage techniques and the best pain relievers from nature’s pharmacy: Arnica, Sweet Birch and Magnesium. 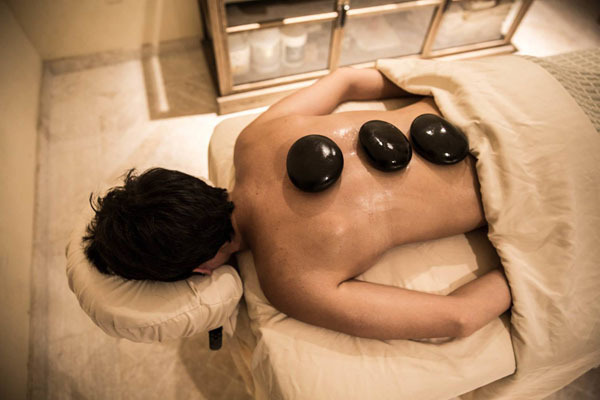 You select your aroma therapeutic journey with this deeply revitalizing experience. Our treatment uses aromatherapy and deep tissue massage to unwind the body, re-boot the mind, and transform stress into balance & clarity. Classic and calming, this massage uses firm yet gentle strokes & technique to reduce tensions & fatigue. This treatment aims to improve blood flow & ease stress. This luxurious treatment delivers instant skin rejuvenation by accelerating cellular respiration, bringing fatigued, over-stressed skin back to life. Therapeutic vitamins and minerals are used to firm, lift, & revitalize the skin. Customized to meet your skin’s specific concerns, the session begins with an exfoliating treatment to sweep away dead surface cells & impurities, Expect dramatic results in appearance, radiance, smoothness, and firmness. Nature’s cure for thirsty, moisture-deprived skin. This hydrating facial immediately replenishes the skin with deeply hydrating botanical blends. A sensorial Soothing Hibiscus Enzyme Peel smooths and calms stressed skin. A nourishing facial massage utilizing the Gotu Kola Healing Balm leaves skin radiant and protected from harsh environmental elements. Ideal for high altitudes, extreme weather and desert climates. Customized for men’s skin care needs, this balancing facial effectively renews skin tone and texture while helping to soothe and restore devitalized, sun-damaged or razor-burned skin. This treatment is a two-step treatment. First, the skin is polished and nourished with a deep scrub treatment and then the body is drenched in a soothing deep hydration treatment leaving skin radiant and deeply nourished. This detoxifying treatment starts with a vigorous exfoliation that stimulates circulation by using volcanic Pumice and Coffee Arabica. Then, a warm wrap with mineral-rich Black Silt Clay and herbal extracts is applied to help smooth and firm the skin. The ultimate skin conditioning treatment begins with a hypnotic massage, layering a warm mineral-rich Seaweed serum infused with aromatic Japanese Ume Plum extracts to revitalize the skin. Then, a detailed massage with our Sea Fennel Massage Wax to deeply seal in moisture for a silky, satin finish. This intensive treatment is designed to reduce puffiness, undereye discoloration and the appearance of fine lines and wrinkles.